Velarium dates from 1887/1888. An old label read 'This drawing of a Velarium was executed by J. McNiel [sic] Whistler, Esq. in the presence/ of his Wife and Alexr. Jno. [Jaylor or Taylor], for the purpose of taking out a Patent for construction/ owing to his controversy with the Royal Society of British Artists.' 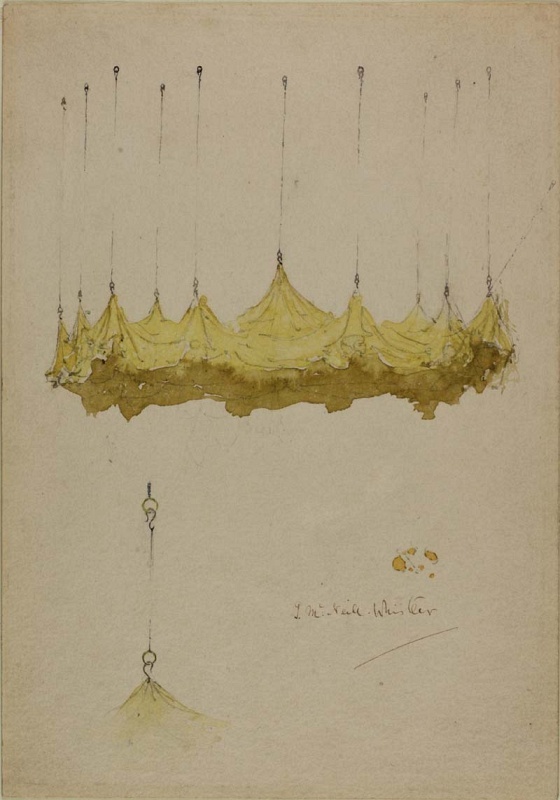 According to the Patent Office (405-8721) Whistler applied for a patent 'for means of suspending velarium panoply or other canopied draperies from ceilings, roofs or otherwise. '; Patent No. 6223 was dated 26 April 1888 but the patent was later abandoned. Although the witness's name was formerly read as 'Jaylor' it is more likely that he was Alexander J. Taylor, upholsterer, aged 43, living in Marylebone with his wife Maria, as recorded in the 1891 census. He was probably born Alexander John Taylor, on 14 September 1847, the son of Alexander Taylor, an upholsterer, in Marylebone. The actual velarium was used for the first time in the exhibition of the RBA in May 1886. When Whistler left the RBA he took his velarium with him. It was the one innovation of which his Society had approved, so they ordered a new one. Whistler reminded them that he had taken out a patent on the velarium, and indeed he had, but so recently as to suggest that he did it merely to foil the RBA.William Ayerst Ingram (1855-1913) commented that it was 'a patent taken out by the Greeks and Romans' (quoted in Pennell 1908). Whistler failed to stop the RBA from putting up another one. The drawing is catalogued in MacDonald 1995 (cat. rais.) [more] (cat. no. 1122).